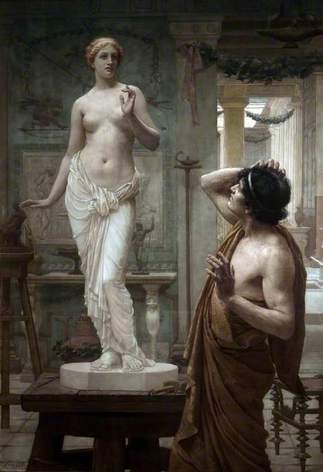 Pygmalion is the name given to a legendary figure from the island of Cyprus, and although Pygmalion is mentioned in Greek mythological sources, the most famous telling of the myth comes from the Roman period, appearing as it does in Ovid’s Metamorphoses. In Ovid’s version of the myth, Pygmalion is a talented sculptor living in, or near, to the city of Amathus on Cyprus. Pygmalion was so engrossed in his work that he shunned the outside world, and came to detest his fellow citizens of Cyprus. 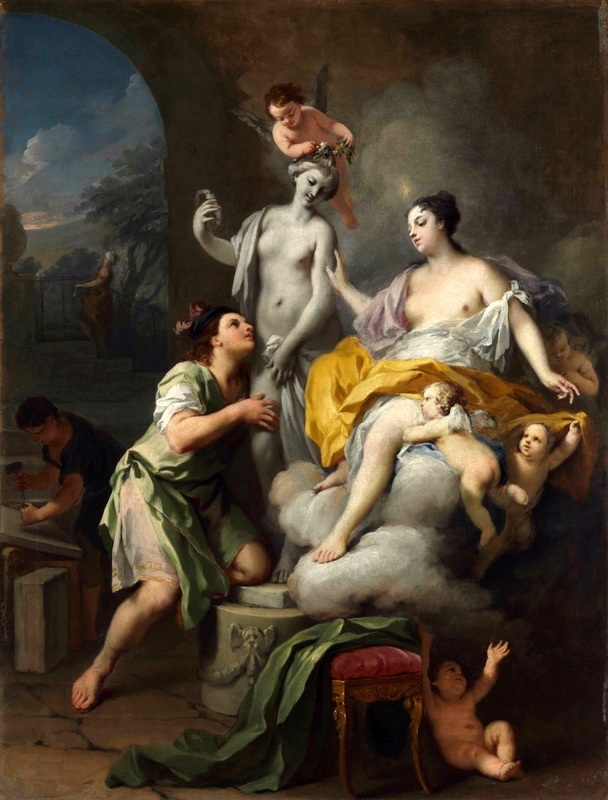 In particular, he to despise all women, for he had seen the Propoetides, the daughters of Propoetus of Amathus, prostituting themselves; the Propoetides had been cursed by Aphrodite (Venus) after they had neglected to worship the goddess. As a result, Pygmalion would spend many hours in his studio, and one sculpture in particular took up most of his time and effort. ​This one sculpture was crafted from a perfect block of ivory, and over time, Pygmalion sculpted it into the perfect representation of the female form. Pygmalion would spend so much time and effort on his creation that he found himself falling in love with it, and soon, Pygmalion was treating his sculpture like a real woman, adorning it with fine clothes and jewellery. Such was Pygmalion’s love for the sculpture that the artisan would exit his studio and visit the temple of the goddess Aphrodite. There, Pygmalion would pray to Aphrodite, asking that his creation would become real. Aphrodite heard the prayer of the sculptor, and intrigued, travelled to Cyprus to look inside Pygmalion’s studio. Aphrodite was impressed with the skill displayed by Pygmalion in creating his lifelike statue, and the goddess even appreciated the fact that it had a resemblance to herself. Thus, Aphrodite decided give life to Pygmalion’s creation. When Pygmalion returned from the temple, he touched his sculpture and found that it was warm to the touch, and soon it was completely alive. Creator and creation were wed, and Pygmalion continued to be blessed by Aphrodite, for he soon became father to a daughter, Paphos, who gave her name to the city found upon Cyprus. In some different versions of the story, Paphos is actually a son of Pygmalion, and a founding figure for the city of Paphos. Other sources, including the Bibliotheca (Pseudo-Apollodorus), suggest that Pygmalion was more than just a sculptor, and perhaps was even a King of Cyprus, and father of a daughter Metharme. There is a suggestion that the lost work of antiquity, De Cypro (Philostephanus), sees Pygmalion not sculpting the statue, but taking one of the goddess Aphrodite from the temple, and installing it in his living quarters; and it is then this statue that is brought to life by the goddess. The story of the Cypriot sculptor is often called Pygmalion and Galatea, for the statue has been given a name. The naming though was done much later than antiquity, and is normally attributed to the Renaissance period when the story was reived in art and word. The name Pygmalion and Galatea was actually used as the title of a play, Pygmalion and Galatea, an Original Mythological Comedy by W.S.Gilbert in 1871, and this work is based the original story for Galatea is turned from stone into a woman, and then back again into stone. It is another play, titled Pygmalion which is more famous today, for this work, written in 1913 by George Bernard Shaw, has been much adapted, but in the case the transformation is not from stone but of speech for Eliza.